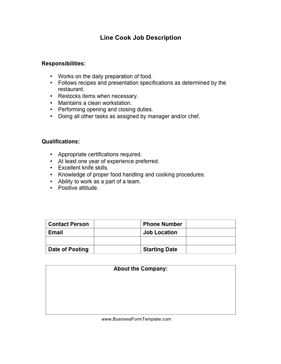 Restaurants, pubs and cafes can use this line cook job description to advertise for cooking staff in their kitchens. It outlines basic qualifications and work responsibilities. Works on the daily preparation of food. Follows recipes and presentation specifications as determined by the restaurant. Doing all other tasks as assigned by manager and/or chef. At least one year of experience preferred. Knowledge of proper food handling and cooking procedures.